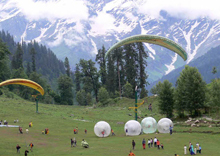 As many of our readers follow the Himachal Pradesh news religiously, we present the latest Himachal Pradesh news for those of you who avidly follow emerging news from Himachal Pradesh updated to the minute. Do send us a on the quality of Himachal Pradesh related news served to you, so that we can make it better for you. Mandi, April 19 (IANS) Climate change can affect the food, water and energy security of a region, Ministry of Earth Sciences Secretary M. Rajeevan said here on Friday. View More..
Shimla, April 19 (IANS) The Election Commission (EC) on Friday barred BJP's Himachal Pradesh chief Satpal Singh Satti from campaigning for two days starting Saturday over his "indecent and derogatory" comment against Congress President Rahul Gandhi. View More..
Shimla, April 19 (IANS) Congress rebel Harish Janartha, who unsuccessfully contested the 2017 Assembly elections from Shimla as an Independent candidate, rejoined the party on Friday. View More..
Shimla, April 19 (IANS) The simmering discontentment over the absence of basic amenities in the area along the China border is forcing 400-odd voters in Himachal Pradesh's remote Kunnu and Charang villages in Kinnaur district to boycott the parliamentary polls. View More..
Shimla, April 18 (IANS) Himachal Pradesh Chief Minister Jai Ram Thakur on Thursday said people have made up their mind that once again the reins of the nation should be handed over to Prime Minister Narendra Modi. View More..
Shimla, April 18 (IANS) Temperatures across Himachal Pradesh fell on Thursday due to widespread rain with Dalhousie town recording the highest amount -- 53 mm, the met office said. Weather will be clear from Friday. View More..
Shimla, April 18 (IANS) Over 100 bikers, from six countries and 15 Indian cities, will motivate voters in Himachal Pradesh on ways to strengthen democracy when they take part in the three-day Eighth Hero MTB Shimla 2019 commencing on Friday. View More..
Shimla, April 18 (IANS) At 91, eight-time matronly Congress legislator Vidya Stokes continues to battle tirelessly to ensure victory of the party in all the four parliamentary seats of Himachal Pradesh. View More..
Shimla, April 17 (IANS) Himachal Pradesh Chief Minister Jai Ram Thakur on Wednesday demanded ban on poll campaigning by Congress President Rahul Gandhi alleging that his repeated "chowkidar chor hai" jibe alluding to Prime Minister Narendra Modi was violative of the model code of conduct. View More..
Shimla, April 17 (IANS) Himachal Pradesh BJP chief Satpal Singh Satti on Wednesday got another notice from the Election Commission over his "inflammatory remarks" against Congress President Rahul Gandhig. View More..
Shimla, April 17 (IANS) Over 2.50 lakh voters of Sirmaur district in Himachal Pradesh on Wednesday asked the two national parties -- the BJP and the Congress -- to come out with a detailed action plan on granting them tribal status, a demand pending for five decades. View More..
Shimla, April 16 (IANS) Himachal Pradesh Police on Tuesday booked a Congress leader for his remarks inciting violence against Bharatiya Janata Party (BJP) state chief Satpal Singh Satti. View More..
Shimla, April 16 (IANS) A criminal case was registered on Tuesday against Himachal Pradesh BJP chief Satpal Singh Satti for using a slur against Congress President Rahul Gandhi while campaigning, police said. View More..
Shimla, April 16 (IANS) The BJP on Tuesday accused the Congress of crying foul over electronic voting machines (EVMs) and said it was the result of their frustration over their impending defeat in the Lok Sabha polls. View More..
Shimla, April 16 (IANS) Himachal Pradesh Chief Minister Jai Ram Thakur on Tuesday said the Congress has neither a vision nor a national development policy, whereas the BJP has a strong leadership of Prime Minister Narendra Modi, who guided the country to be one among the top five nations. View More..
Shimla, April 16 (IANS) The ruling BJP in Himachal Pradesh on Tuesday asked the state election commission to register a criminal case against a Congress leader for issuing threats to Bharatiya Janata Party state chief Satpal Singh Satti. View More..
Shimla, April 16 (IANS) High school and college students of Himachal Pradesh are daily getting tips on ways to strengthen democracy through 'Walls of Democracy' set up in 7,681 places, poll officials said. View More..
Shimla, April 15 (IANS) BJP President Amit Shah will address election rallies next month for the four Lok Sabha seats in Himachal Pradesh, it was announced on Monday. View More..
Shimla, April 15 (IANS) Widespread rains and thundershowers have been forecast over the next few days in Himachal Pradesh, even as the state witnessed a rise in mercury on Monday and recorded temperatures one to five degrees above the average. View More..